Anonymous surveys are great for providing topline feedback, and even for finding unexpected issues via open-ended questions. What they usually fail to let you do is probe deeper — sometimes an issue arises that is interesting and requires additional information. Most survey tools leave you hanging. You might consider using all-hands meetings to probe into these deeper issues. But for most people running a company with many employees, this would be time prohibitive. Plus an employee may not be comfortable unmasking their anonymity to provide more context regarding their feedback. 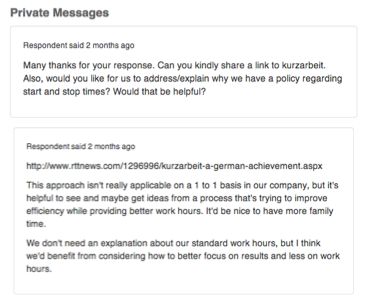 This is why survey platforms with anonymous messaging tools are invaluable. 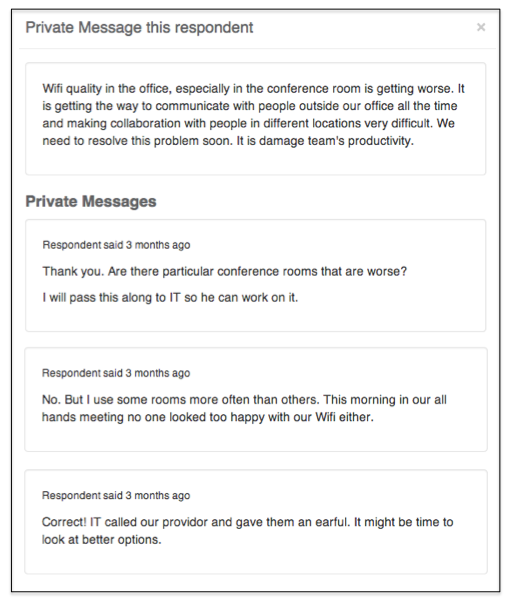 More probing needed: A manager reads anonymous feedback that isn’t clear and needs further clarification. Or perhaps reads feedback that seems to be an outlier and needs more information. Select the private message function: With private messaging, the manager can select to send a private message to the original writer. The system knows who the respondent is but does not reveal this to the manager. Anonymity is retained while allowing for further probing. Message received: The respondent receives the manager's request for greater clarity and can continue using the private message function to remain anonymous. Continue the conversation: The respondent and manager can continue messaging each other until all information has been gathered. Handled with care and sensitivity, the private message function served as a powerful communication tool that respected the initial respondent’s privacy while letting the manager address the concern directly. And sometimes, just the act of reaching out to someone will give the anonymous employee the confidence and trust necessary to broach the topic in person with their manager. Story: It’s not uncommon to forget to bring up an issue—problems that are inconveniences often get forgotten once the next fire has to be put out. And our software client was no different. After moving to new offices, feedback kept coming in about the facilities. However, by using private messaging, our client was able to narrow down the issue to an IT problem that was no doubt affecting the entire organization. Take a look at the actual back-and-forth between an employee and the HR manager, enabled by private messaging. Multiple conversations like this showed employees that their concerns would be addressed, and that they were expected to be active participants in improving company culture. Thanks to wins like these, our client enjoys record marks for employee happiness. Can you guess how much faster your brain processes images than text? Find out what this means for your employee surveys.